I wanted to celebrate Saint Nicholas Day, just as we did when I was a child, but I also wanted to keep it simple. It's way to easy to go overboard with this and Christmas. 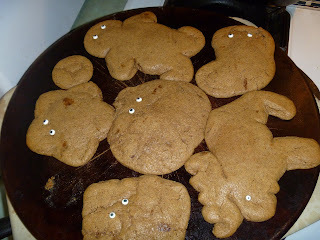 I settled on baking gingerbread cookies yesterday, from the dough we'd prepared the night before. Last night after dinner we talked about Saint Nicholas of Myra (again), and told stories of the miracles he performed and kind things he did for people. We wrote a story on big paper and left it clipped to the easel for Saint Nicholas to read, left gingerbread cookies for him and "Black Pete" (Zwarte Pieten) on the mantle, and put the children's shoes in front of the fire place. 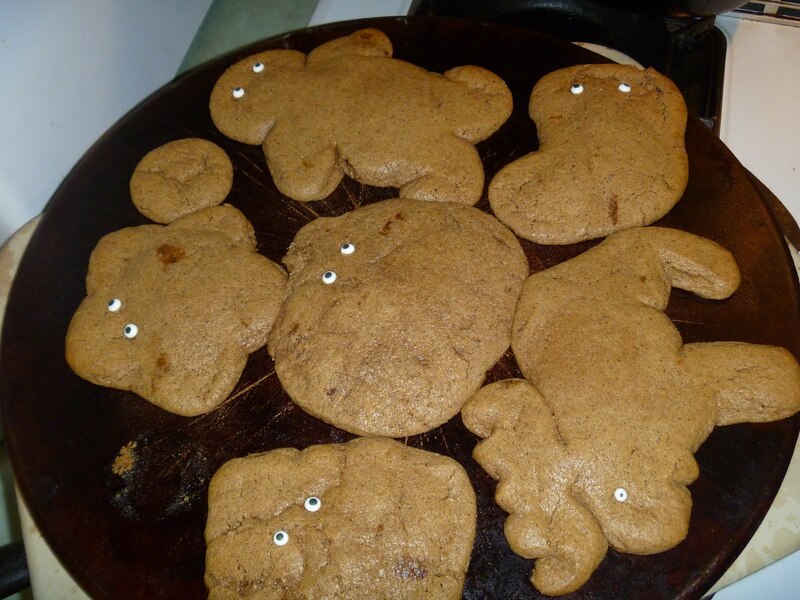 In our house, everything made of gingerbread gets eyes. 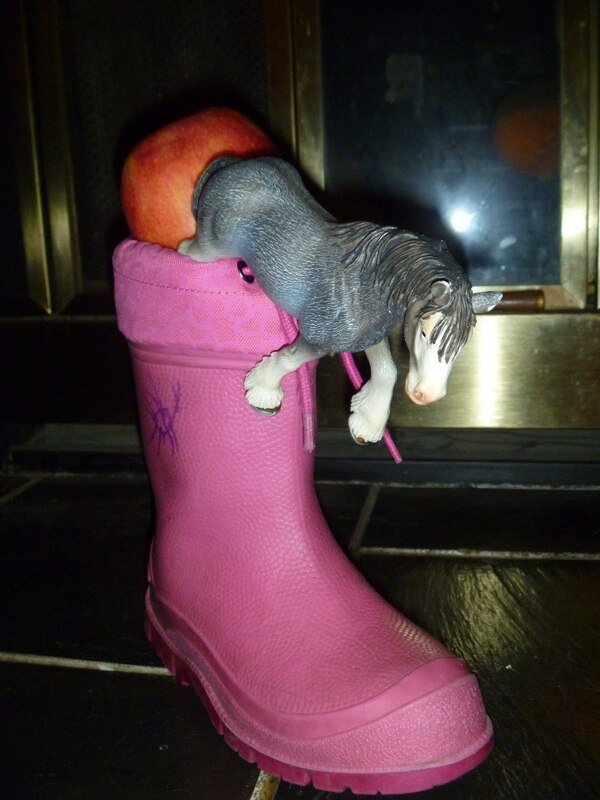 This morning they awoke to find in their shoes an apple, chocolate, a lollipop, a Schliech horse, and three quarters (like the three bags of gold Saint Nicholas left for the poor man's three daughters). 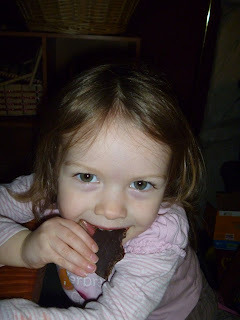 Assessing the goodies, Maeve declared, "I did not expect so much stuff! Three quarters means I can buy three more lollipops!" Whimsy carried her little Shetland pony around for hours, and asked to buy a steamer with her coins when she and I went on a "date" while Maeve was at lunch with a friend. The only disappointment is that the Saint Nicholas books that I ordered from Amazon didn't get here in time. I really thought they would. There's one (The Real Santa Claus) that looks like a compilation of history, folklore, and art, compiled and written by Marianna Mayer. If you know me and my love of children's picture books, you might know she wrote some others that I adore. Oh well. We'll probably celebrate again, with my parents, brother and nephew, when my nephew gets back later this week. My mom can get her wooden shoes out for that one, (the little expensive decorative ones that I bought her just so she could take them to school and tell her kids about Saint Nicholas, which she hasn't done yet. If your child attends her preschool, please tell her you're disappointed.) Hopefully the books will be here.